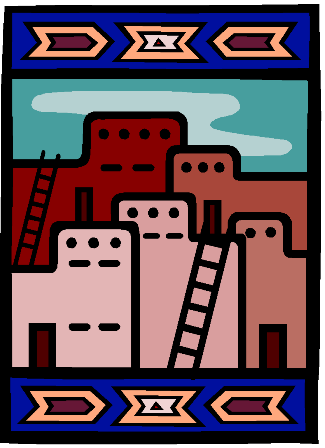 The Southwest collection is a rich and extensive resource for information on New Mexico state history, geography, culture, ethnology, government, and economics. The Southwest collection is complemented by the State and Federal Documents collections of the New Mexico State Library and the New Mexico State Archives, all located within a single facility. Frequent research topics in the Southwest collection include: the history of New Mexico places and families, railroad history, mines and mining, New Mexican writers, land grants, Santa Fe neighborhoods and buildings, Indian pueblos and reservations, farming and ranching, and Western trails. To find a book in the SW collection, see the State Library’s online catalog. For a list of recent Southwest collection acquisitions, see "New in Southwest." La colección Suroeste es un recurso rico y amplio en información de la historia estatal, de la geografía, cultura, etnografía, economía, y del gobierno de Nuevo México. La Colección Suroeste está complementada con las colecciones Documentales Estatal y Federal de la Biblioteca del Estado de Nuevo México y del Archivo del Estado de Nuevo México, ambos están localizados en un único edificio. Temas de investigación de la colección Suroeste con frecuencia incluyen: la historia de los sitios y familias de Nuevo México, la historia del ferrocarril, las minas y la minería, los escritores de Nuevo México, las concesiones de tierras, los barrios y edificios de Santa Fe, los pueblos y las reservas de los Indios Nativos, la agricultura y ganadería y los caminos del oeste. Para encontrar un libro de la colección Suroeste vea el catálogo de enlace de la Biblioteca del Estado: online catalog. Para una lista de las materias recibidas recientemente en la colección Suroeste vea “Nuevo en el Suroeste”: "New in Southwest." The Library subscribes to many current New Mexico newspapers. The Southwest Collection also holds thousands of rolls of microfilm for New Mexico newspapers dating from the territorial period of the 1850’s to the present. Microfilm reader/printers are available on site. Since we do loan microfilm, not every reel is available for in-library use every day. The State Library will loan another library up to 3 reels of microfilm per request for a period of 15 days with no renewals. Please contact your local library to initiate your request. The Library also has the New York Times on microfilm from 1851 to mid-September 2008. The Library also has the Index to the New York Times from 1851 to 2011, and the Personal Names Index from 1851 to 2003. The Access Newspaper Archive database collection of historic newspaper content is also available in the Library. Explore New Mexico history and genealogy in old newspaper archives from 1849 - 2012. A research guide outlines the New Mexico specific resources which are available in the Southwest Collection. The Library reference collection contains the following titles – Who’s Who from 1932-2008; Who’s Who in America from 1908-2009; Who’s Who in the South and Southwest from 1947-1987; and Who’s Who American Women from 1958-2007. Bureau of Indian Affairs materials are located in the Federal Collection and the Southwest Collection. The following plus other materials are located in the Southwest Collection: Indian Census on microfilm from 1885-1940, rolls are organized by tribe; Superintendency Records on microfilm from 1849-1880; and the Santa Fe Indian School Records on microfilm from 1890 to 1918. Census records issued by the U.S. Census Bureau from 1790 to the present are available. The historical Federal decennial census schedules on microfilm for New Mexico are available for the following years: 1850, 1860, 1870, 1880, 1885 Territorial, 1900, 1910, 1920, 1930, and 1940. Census data is also searchable on the Ancestry Library database which is available in the Library. The State Library has many New Mexico city and county histories. They are all listed in the online catalog. The following cities/counties for the dates noted are available for on site use only. Please be aware that the date range noted may not include the directory for each year in the range. They are all listed in our online catalog. The Library has a large collection of telephone books for major and small towns in New Mexico, as noted below. They are all listed in our online catalog. They are available for in library use only. The Southwest Collection and the State Archives contain many genealogical resources including Ancestry Library Edition, books, indexes, genealogical society periodicals, church records, census records, DAR indexes, Sanborn Maps for New Mexico (specific information below), and various National Archives records sets many of which are on microfilm and most of which must be used in the Library. This is a microfilm collection of historical records written in Spanish (official records, directives, treaties, court transcripts, wills letters, and other documents) relating to the Spanish Colonial era of the Southwest. The collection includes indexes in both English and Spanish. Dating from 1884 through the 1950's, the Sanborn Fire Insurance maps offer comprehensive information about commercial, industrial, and residential sections of cities and towns throughout New Mexico. The maps are available on microfilm or on the Sanborn Map database, both may be viewed in the library. Copyright restrictions prevent librarians from making copies of entire maps. This database is available for use in the building only. The Library holds a small and select collection of historical and current Southwest fiction with an emphasis on New Mexico, including children's picture books and young adult works. To assist you in locating a good read, here is a guide to New Mexico authors and classic books. The Southwest Collection contains numerous current and historical magazine and journal titles. They are available for in Library use only. This non-fiction collection contains both current and historical works of interest to scholars and historians. Some works may be taken out of the Library but the majority of the resources available must be used in the Library.